As someone who is continuously keeping up to date with the latest trends and developments within the social media world, I typically peruse the business section at Chapters or explore Amazon for new books on the subject. However, most of the time I come across monotonous retreads, with the majority of the books available repeating the same information, mainly gearing the content to introductory users. 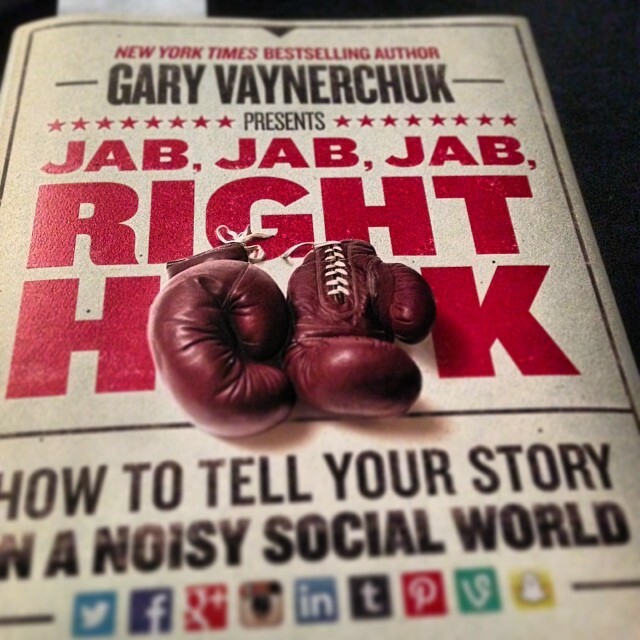 That’s why Jab, Jab, Jab, Right Hook: How to Tell Your Story in a Noisy, Social World, written by the highly esteemed Gary Vaynerchuk, is a refreshing guide on leveraging social media and building interactive communities. What makes JJJRH an essential read for anyone who wants to effectively captivate audiences is that it dissects the failures of certain social posts and subsequently highlights the successes of effective content. Rather than explaining the basics of each social network or telling readers to simply ask users to “Buy Now!” 24/7, Vaynerchuk imparts one central piece of advice: engage your audience. Of course, the goal of any social media “guru” is to create content that generates engagement in the form of likes, comments, and shares. Unfortunately, far too often brands are using their social channels to repeatedly ask users to follow through with an action rather than engaging with them. The title of the book pretty much gives away the main formula to achieve success: give a series of jabs in the form of content that engages your audience, and once in a while, throw a right hook in the form of a call to action that can translate into a potential lead and/or sale. This type of thinking meshes with the type of strategies I always put forth to clients: your content should never be 100% self-promotional. Reel fans in with tips, how-to content, posts relating to popular culture, etc., and then once they are hooked to your every word, hit them with that right hook that can lead to conversions. Additionally, Vaynerchuk provides a review of the remaining emerging networks: Google+, LinkedIn, Vine, and Snapchat. An interesting lesson I learned from reading this book was the fact that some of the branded organic (not paid) content I push out lacks a logo; in fact, it seems to be a common mistake by most, if not, 99% of brands that use social media. Investing in high-res images is becoming far more important with the proliferation of mobile technology, and image-based content has proven to generate more interaction than simple posts. With that in mind, many brands fail to slap their logos on branded content. Once I saw Vaynerchuk point that out, I figuratively kicked myself because it’s an easy thing to forget when creating social content, but it can be a costly mistake when advertising to new audiences. That’s not to say you should stick your logo on everything; rather, plant your logo on branded content or social-based advertisements. Social media is a rapidly involving element of online marketing. As a result, what is written today may become outdated within a a year or even a couple of months. However, this book provides a timeless lesson in producing intriguing content to build audiences and create active communities. Unlike the traditional book on social media, this is a great read even for those who have mastered social marketing and direct teams of community managers. Reblogged this on Web Marketing Services London.